Soon after SS-Obersturmbandführer Werner Sternbeck from SS-Kampfgruppe Peiper had entered the Hôtel du Moulin in Ligneuville he heard several large explosions, he rushed out an saw a Panther at full ablaze 100 meters down the road. The Panther had been knockout out by A Sherman M4A3 from the 14th Tank Battalion. The US tank had taken up positions further up the backside along the main street had manage to put one 76 mm shell through the upper deck of the panzer. Jochen Pieper saw his personal friend and the commander of the Panther 152 SS-Untersturmführer Arndt Fischer bailed out with his clothes on fire. 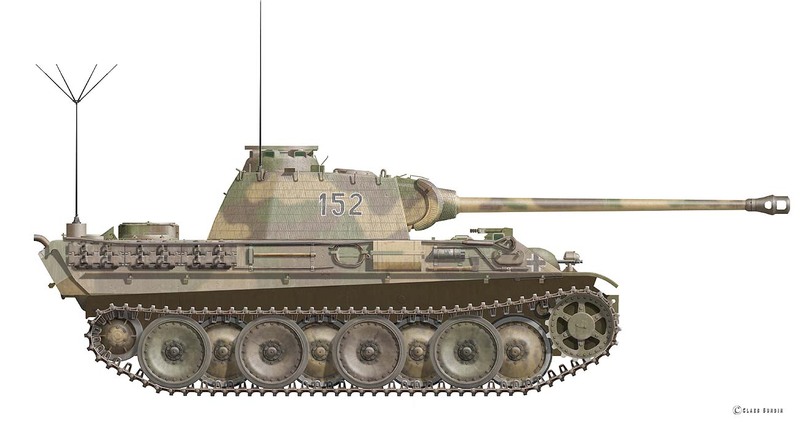 Peiper grabbed a Panzerfaust but a Königstiger entered the scene and quickly expired the tank. Soon 22 US soldiers appeared with their hands in the air, the SS-men furious after what they saw as a cowardly attack, single out eight survivors and took them behind the Hotel and shoot them. The driver SS-Sturmmann Wolfgang Simon didn't manage to evade and was burned to death in his panzer.